*Prices subject to change without notice. Taxes included (GST : 5% + QST : 9.975%). Payment methods: Visa, Master Card and cash. We DO NOT accept Interac. In case of discrepancy between the information provided on this website and at the gate, the gate information prevails. 4 charging points for electric vehicules (free reloading). To access the charging points, you must pay the current price of a parking space, which is not included in the cost of recharging. Wi-Fi is the name of the technology that allows users to access a local wireless network connected to the Internet. The Old Port’s Wi-Fi network is provided free of charge within an area along the Promenade from the Maison des Éclusiers (West) to Shed 16 (East). How do I access Wi-Fi on the Quays? While you are on the Promenade, simply tell your device to connect to the available network. Next, open your Web browser. A connection page will open. You will now be able to surf the Web. Wheelchairs available at the Montréal Science Centre box office. Free service by presenting an ID (driver's license, health insurance card, etc.). By 2017, the public consultations will lead to a master plan for the revitalization of the Old Port of Montréal, including the Pointe-du-Moulin site and its Silo no. 5. In view of the upcoming celebrations of Canada’s 150th anniversary and Montréal’s 375th, OPMC wants to create an innovative renewal in terms of urban design, landscape and sustainability for Montréalers. To ensure a safe and pleasant visit to the Quays to all its visitors, the Old Port of Montréal Corporation has implemented site regulations. The Prevention/Protection Department sees to their application. Walking a pet on site is tolerated provided they are on a leash. To avoid endangering or disturbing others, we ask that persons accompanying the animal promptly pick up all droppings and maintain control of the animal at all times. Please note that animals are not allowed inside any of the buildings and are not permitted on Clock Tower Beach. Fishing is forbidden on the site with the exception of the ice fishing village at the Clock Tower Quay, within its hours of operation. Pedestrians have the right-of-way at all times. Skateboards are not permitted on site. Unless otherwise authorized by the OPMC, motorized vehicles (electric or gas-powered) are not permitted in any area closed to automobile traffic (such as the promenade). Mobility devices (such as motorized wheelchairs and three- or four-wheeled scooters), bicycles, and electric pedal bikes are permitted in these areas. Automobile traffic is only permitted in the Alexandra, King Edward, and Clock Tower parking lots and on their access roads. Any and all traffic anywhere on the OPMC site must respect the 10 km/h speed limit. 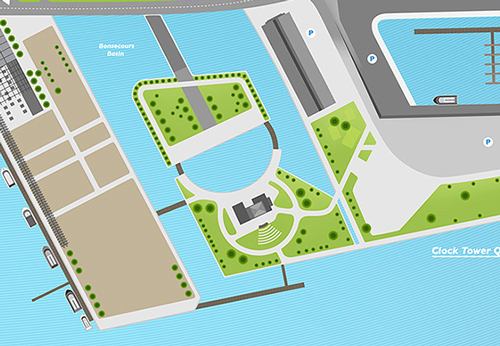 The mission of the Old Port of Montreal Corporation is to manage, develop, and hold activities on a large urban Site dedicated to recreation, tourism and culture, a place for fun and discovery. Within this context, the OPMC provides its millions of visitors with event programming and commercial services that may affect the noise environment. With a view to pursuing its mission while taking into consideration the tourist and residential vocation of the historic Old Port neighbourhood, the OPMC had adopted a Noise Management Policy that defines standards and criteria for events and merchants, and other enterprises that affect the noise environment at the Old Port and its surroundings. Sound emanating from merchants and their outdoor terraces, including amplified and non-amplified music. No music, whether amplified or not, coming from unique outdoor events and/or from establishments and/or commercial terraces shall be heard from rue de la Commune in an area bound by the Mills Bridge to the West, rue de la Commune to the North, the Clock Tower Beach to the East, and the Saint Lawrence River to the South, unless prior authorization to the contrary is obtained from the OPMC. As required, the OPMC will measure sound using devices made for that purpose, for the purpose of controlling and verifying adherence to established standards. A representative of the OPMC is authorized to take these measurements, and has the power to intervene with the Producers or Merchants at any time if the standards are not respected. Producers of unique events and Merchants must adhere to this policy, and must submit themselves to any decision made by representatives of the OPMC while events are being held or during normal proceedings. Any breach of this policy or failure to adhere to the directives issued by OPMC personnel shall be considered a failing, and may be subject to the sanctions outlined in the agreement signed with the OPMC. The acceptable sound level during unique outdoor events, including sound-checks, is 80 decibels (dB(A)) between 9:00 a.m. and 11:00 p.m., unless prior authorization to the contrary is obtained from the OPMC. The acceptable sound level produced by merchants (including terraces) is 80 decibels (db(A)) inside the building and on the outdoor terrace or respecting the perceptible limit within the territory of the OPMC. The Old Port of Montreal Corporation is a member of the Table de concertation du Vieux-Montréal, along with representatives of the Association des commerçants and residents of the neighbourhood. The OPMC works with the Permits and inspections division of the Borough of Ville-Marie to ensure that noise regulations are observed. The OPMC agrees to notify them of its event scheduling and its commercial activities in order to keep the work groups informed of OPMC activities that may affect the noise environment for visitors and residents.